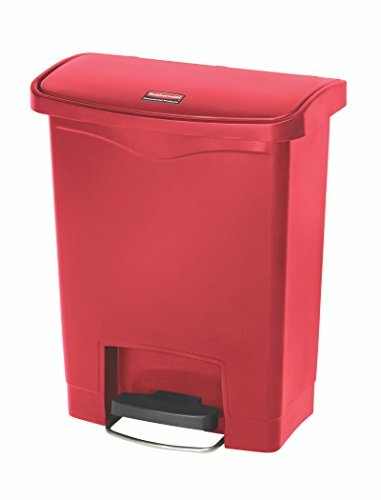 Durable and dependable, the Rubbermaid Commercial Slim Jim Front Step-On Trash Can offers a clean, hands-free waste control solution. The wide design and small footprint of this receptacle hugs the wall to provide maximum volume while using space efficiently. These garbage cans feature convenient foot pedals with increased pedal clearance for easy foot access and hands-free waste disposal. A tight-fitting, overlapping lid has a controlled close to reduce noise and an internal hinge design that prevents wall damage. Providing safe, sanitary waste management, these plastic trash cans are perfect for use in health care environments. It maintains reliable, puncture-resistant strength and stability, and will not rust or chip. Offering easy maintenance, this step-on receptacle features smooth contours with rounded corners for easy cleaning and a liner retainer band that securely holds garbage bags.